"Inamura no Hi" means fire of rice sheaves. Asian Disaster Reduction Center (ADRC) developed Tsunami educational materials with basic knowledge of Tsunami in 8 countries, using "Inamura no Hi" story, funded by the Government of Japan. The Asian Disaster Reduction Center (ADRC) additionally printed the Tsunami awareness booklets "Inamura-no-hi" under the initiative of UNESCO Intergovernmental Oceanographic Commission's response to the December, 2004 Indian Ocean tsunami, in line with the strengthening of the Indian Ocean Tsunami Warning System (IOTWC) activities, and in conjunction with the IOC's on-going plan of action to promote capacity-building, training, educational awareness and information on tsunami. 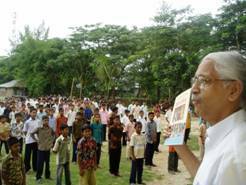 Around 5,000 copies of booklets were printed and distributed each in the three target countries, India, Bangladesh and Indonesia in cooperation with the partner NGOs (BDPC, SEEDS, and MERCY Malaysia). With support from UN/ISDR, ADRC additionally printed of 5,000 copies of each of children versions of "Inamura-no-hi" booklets destined to Malaysia, Singapore and Sri Lanka which are on the Indian Ocean rim. Besides, the English version for Singapore was modified and developed both English and French versions of the booklets for the African countries: Somalia, Kenya, Seychelles, Tanzania, Comoros, Mozambique, Madagascar,South Africa, Mauritius, Re Union, and Djibouti, where will be affected by a Tsunami in the future. 30,000 copies of English version and 20,000 copies of French version of the booklets were printed and delivered to the ISDR Africa Office for wider dissemination. With the initiative of the JICS (Japan International Cooperation System), the English version of the booklet was translated into Spanish for the Latin American countries.